On Wednesday May 2, the Minneapolis City Council will hold a public hearing over the resolution proposed by Council President Barb Johnson that critics say would restrict Occupy Minneapolis’ right to gather at Peavy Plaza and other public spaces controlled by the City. At a committee meeting on April 18, during which several Occupy activists were permitted to speak, the City was accused not just of curbing the right to free speech and free assembly, but of forsaking Minneapolis’ homeless population. “If you’re not going to provide shelters for homeless veterans, and yet there are members of this City Council who want to spend millions of dollars for a bailout for the Vikings, there’s an incongruity there,” said an activist named Lee. “Peavey Plaza is one of the few safe places that homeless people such as myself can go to have a good night’s rest without having to worry about rapists or thieves,” echoed Occupy activist Xman Dee. 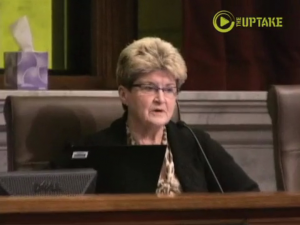 The Council President may not have the support she needs to pass the resolution. After she introduced it on April 13, the council voted 9-4 to send the resolution to a public hearing instead of passing it outright. A new era in Minneapolis and Minnesota politics began Monday (Jan. 6) as seven new City Council members -- including the first Latina, the first Somali and the first Hmong-American to be elected to the 13-member body -- were sworn in and new Mayor Betsy Hodges called for an end to the “gaps” between white people and people of color in the city. A bill now heading to the Minnesota House floor bans public school employees from using district resources to advocate a political agenda.